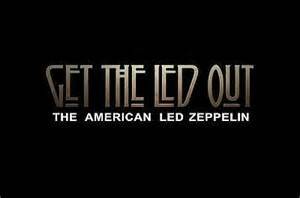 I’ve seen my share of tribute and cover bands, but I had never seen anything quite like Get The Led Out (GTLO). Dubbed “The American Led Zeppelin”, this six-piece band performed Friday night at Ralston Arena to a nice sized crowd – many of whom remember the original sounds of Led Zeppelin. These guys did not disappoint, and if you closed your eyes at times, it was hard to believe this wasn’t the real deal. As lead singer of GTLO, Paul Sinclair has a big job. He must carry the show, lead the way, engage the crowd and share his passion for those of us who loved Jimmy Page, Robert Plant, John Paul Jones and John Bonham. I am thrilled to let you know, that he performs that duty in excellent fashion. It certainly helps that he surrounds himself with very talented musicians, who played and sang with equal fervor. The sound was tight, strong, and somewhat amazing. There is nothing 'fake' about this band. They seem to encapsulate the pure essence of Zeppelin, and they do it with intensity and sincerity. In 2 1/2 hours, these boys from Philly give the concert-goer more than they could ask for and yet left them wanting even more. How beautiful that the discography of the original Led is so deep, that you know this band can go night after night and still not hit every tune in one performance. So - that means you need GTLO another shot the next time they come around. I assure you, it is well worth the time and money.